Solid Bench is an attempt to revive the fine woodworking tradition in India. For us, Furniture is an outcome. The TREE defines form. At Solid Bench, while handcrafting furniture, we never hurry, and we never hide. Joinery is celebrated. Patience is rewarded. We go by the holy grail of woodworking. Measure twice, cut once. In a mass consumer dominated world of assembly line furniture, Solid Bench, is a boutique carpentry studio with a different approach. 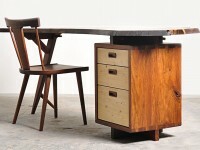 Inspired by Japanese tradition and the American crafts movement, we have launched the LIVE EDGE Furniture Collection. A tribute to nature, our masterpieces are a celebration of the anisotropy of natural wood. Our furniture emerges out of the form defined by each individual tree we select. Our work incorporates traditional joinery techniques, natural oil finishes and minimalistic designs. We work with sustainably harvested East Indian Rosewood, Teak and White Oak Trees. The natural imperfections of wood are incorporated into our designs with fine woodworking skills. The wooden grains are highlighted with the application of natural oils like Tung and Linseed. At present, we run a woodworking center in Gurgaon (Delhi/NCR) and we are in no hurry to expand. We see ourselves, not as traders, but creators. We take pride in our craftsmanship and enjoy the process of giving the tree a new life & form. We encourage our customers to take the same journey with us, right from choosing their own live edge slab to witnessing the transformation of the tree into a piece of art. Refund is within 48 hours for any manufacturing defect or wrong product delivery only. We may accept orders from outside NCR depending on the item size and shipping weight.